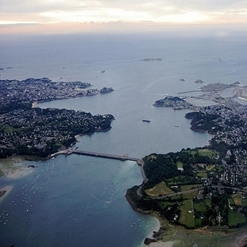 It is no doubt most preferred tourist destination in the city of Saint-Malo. These ramparts surround the whole St. Malo, they follow the château of Saint-Malo. You can explore scattered statues of Duguay-Trouin, Jacques Cartier, Surcouf and Chateaubriand on the ramparts. Visitors still fascinated in the history of Saint-Malo, discover the hotel Asfeld and see conserved destruction of the Second World War.